Climate Depot alerts us to a breakthrough moment for the erstwhile "newspaper of record". 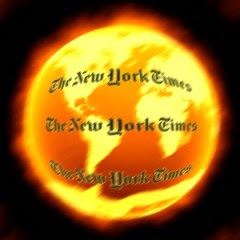 Put simply, even the Times has begun openly mocking the the global warming bunko scam. Apocalyptic scenarios [like Y2K] are a diversion from real problems — poverty, terrorism, broken financial systems — needing intelligent attention. Even something as down-to-earth as the swine-flu scare has seemed at moments to be less about testing our health care system and its emergency readiness than about the fate of a diseased civilization drowning in its own fluids. We wallow in the idea that one day everything might change in, as St. Paul put it, the “twinkling of an eye” — that a calamity might prove to be the longed-for transformation. But turning practical problems into cosmic cataclysms takes us further away from actual solutions. Last one out of the global warming panic room, please turn out the lights. Linked by: Ace of Spades and Climate Depot. Thanks! Well, at least the New York Times is making an effort. Here in the UK, where the country has more or less ground to a halt because of snow and ice, the BBC is still giving us the usual global warming crap. They have mentioned once the scandal of "Dr" Pachauri of the IPCC, the extreme cold gripping Europe and N. America. NY Times prints opinion piece by scientifically illiterate libertarian. More news at 11. I can't get excited by an op/ed piece written by an individual rather than the Times staff. I don't see it as some kind of tectonic shift. Sorry.